Abstract: Insects normally cause economic losses in soybean production. The level of infestation and the management practices used to minimize these losses vary annually. Since personal and institutional memories tend to be short in these times when management practices change rapidly and people move constantly, it is beneficial to record the events of each year. The survey-based soybean insect losses described here provide a glimpse of current soybean management practices and allow one to see evolving trends. During 2003-2007, scouting became more common and insecticide seed treatments began to be used. Stink bugs (Hemiptera: Pentatomidae), bean leaf beetles (Coleoptera: Chrysomelidae) and three-cornered alfalfa hoppers (Hemiptera: Membracidae) were the major pests in all four years of losses. It is our hope that these insect loss estimates will encourage improved insect pest management by focusing research and extension efforts where it can have the largest benefit. Mississippi soybean production has been gaining prominence in recent years with increasing yields and prices (USDA NASS 2007). A major reason for increased yield has been a shift from a late-season production system to an early-season production system (Heatherly and Hodges 1999) . As productivity and profits have increased, the need for improved pest management has increased. In 2004 we began to annually estimate insect losses from the various pests with the goal of monitoring and improving insect pest management. These estimates are based on surveys of consultants and extension personnel, similar to those used to estimate insect losses in cotton (Williams 2006) . While the costs and losses estimated for a pest in any given year is subjective, these losses provide an historical record of pest pressure and management practices as well as providing an estimate of the economic impact of the various soybean pests. It is our intention to continue to compile these losses to soybean yields in the future. We also encourage entomologists in other states to estimate losses so that we may gain a better regional or national picture of the impact of insect pests on soybean production. A survey was sent to crop consultants and extension personnel in the fall of each year. Surveyed people were those who actively scouted soybean fields and those who assisted growers in making soybean pest management decisions. These surveys were compiled and then combined with our own experience to estimate the various fields in the table. Acreage, yield and price data were drawn from Mississippi Agricultural Statistics Service publications (USDA NASS 2007). The estimates were placed in an Excel spreadsheet (Microsoft Office 2003, Microsoft Corp.) to make the various calculations. The actual formulas used in the spreadsheet are in Appendix 1. Soybean insect pest management intensity increased over the last four years, with scouted acreage more than doubling and the average number of insecticide applications doubling (Table 1). Given the high yield and price of soybeans in 2007, this increased protection was likely economical in most cases. Insecticide seed treatments have just begun to be used in Mississippi, so the impact of this technology has not been realized yet. Table 1. Overall Mississippi average soybean management and performance, 2004-2007. 3 estimate. Final price not available from NASS at submission time. Table 2 highlights management and losses from those pests causing the largest economic losses in MS soybeans from 2004-2007. Stink bug (Hemiptera: Pentatomidae), a complex of southern green (Nezara viridula), green (Acrosternum hilare), brown (Euschistus servus), red-shouldered (Thyanta spp.) and red-banded (Piezadorus guildinii) stink bugs is the major pest of soybeans each year, infesting every acre, causing both yield and quality losses. Bean leaf beetle, Ceratoma trifurcata, (Coleoptera: Chrysomelidae) and three-cornered alfalfa hopper, Spissistilus festinus, (Hemiptera: Membracidae) cause different types of damage but caused about the same amount of loss each year. The soybean looper, Pseudoplusia includens, (Lepidoptera: Noctuidae) caused more damage in 2007 than in previous years. 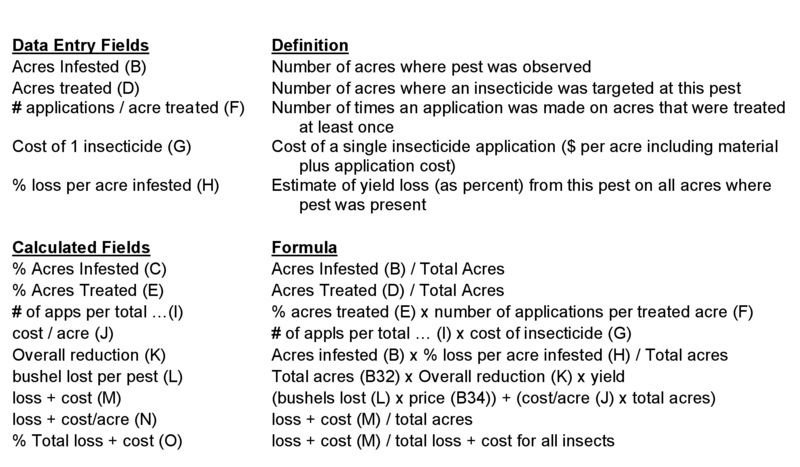 Yield losses and insecticide applications were relatively rare for all other pests (Appendices 2-5). Table 2. Losses and management of major soybean pests in Mississippi, 2004-2007. One factor that has not been broken out in these soybean losses is the impact of double-cropped soybeans following wheat. Double-cropped acreage in Mississippi has traditionally been very small, but with wheat acreage increasing in Mississippi, double-cropped soybeans were more common in 2007. These acres tended to receive more foliar applications for soybean loopers and stink bugs and had lower yields than full-season soybeans, accounting for much of the increase in the number of foliar applications in 2007.The complete soybean loss tables are found in Appendices 2-5. These losses could not be calculated without the assistance of numerous crop consultants and extension personnel who willingly completed this survey each year. We also acknowledge Michael Williams who has compiled insect losses in cotton for many years which gave us the idea to start a similar program in soybeans. Heatherly, L. G. and H. F. Hodges [eds.]. 1999. Soybean Production in the Midsouth. CRC Press, Boca Raton, FL. USDA NASS. 2007. NASS-Mississippi Reports and Statistics, http://www.nass.usda.gov/Statistics_by_State/Mississippi/index.asp. Williams, M. R. 2006. Cotton insect losses, http://www.msstate.edu/Entomology/Cotton.html. Appendix 2. Soybean insect losses, 2004. Appendix 3. Soybean insect losses, 2005. Appendix 4. Soybean insect losses, 2006. Appendix 5. Soybean insect losses, 2007.